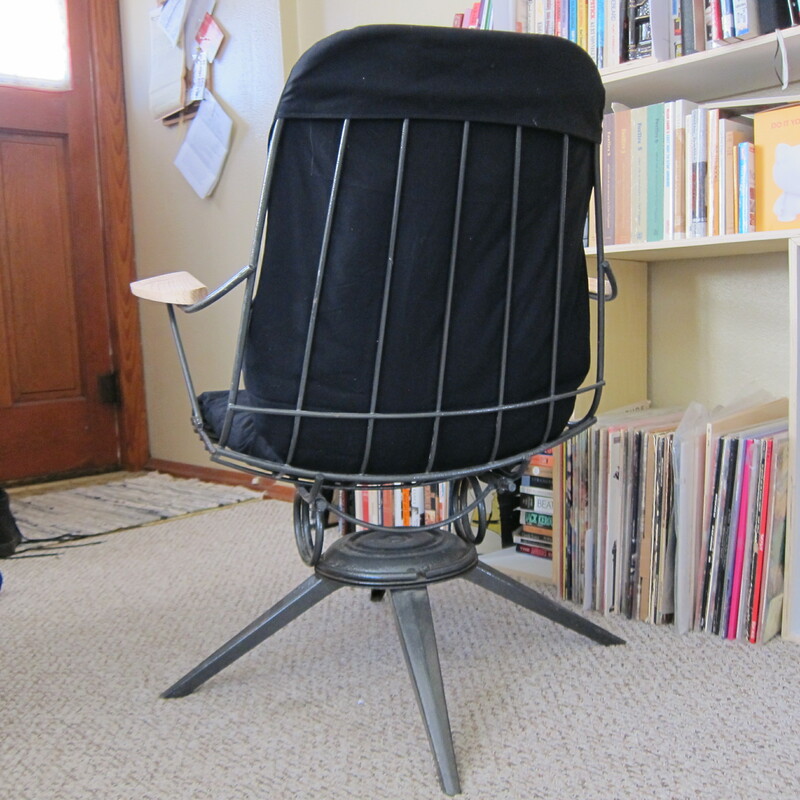 I’ve wanted a vintage wire frame chair for a while now, but gave up on finding one and bought a lounger instead. The other night at an auction I saw a wire chair that looked exactly like what I’d wanted, but unfortunately, it’d already sold. I was pretty dissapointed but took a picture of it anyway, thinking I might find one in the future. 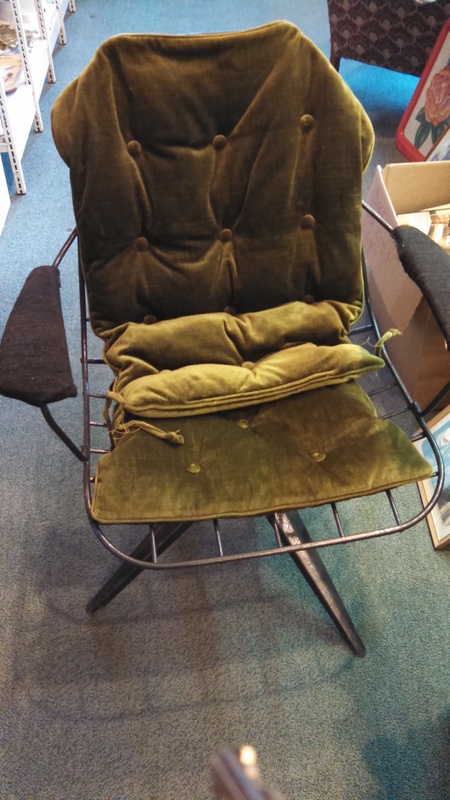 Lo and behold, not a week later I found the same exact chair (only with hideous green velvet cushions rather than black leather) at an antique store. I swiftly carried it upstairs from the basement and bought it. My mom, whom I was with at the time and Jason, who saw it get dragged into our house both agreed it was hideous, but I saw potential. I don’t have a lot of time right now to make it look the way I want, so I just did a few quick changes. Since that metal parts of the chair are still in great shape, I just changed the arm rests and made a slipcover for the cushions. I sewed both of the cushions together in the middle to make one, then laid it out on a piece of black cotton fabric I already had. I then traced around the cushions with tailors chalk to make a template and sewed the two pieces of black cotton together for a quick slipcover. I made a small pocket on the back so the cover and cushions could just rest over the wire on the back. For the arms I cut out new arm rests from cedar and plan to eventually sand, route and stain them. 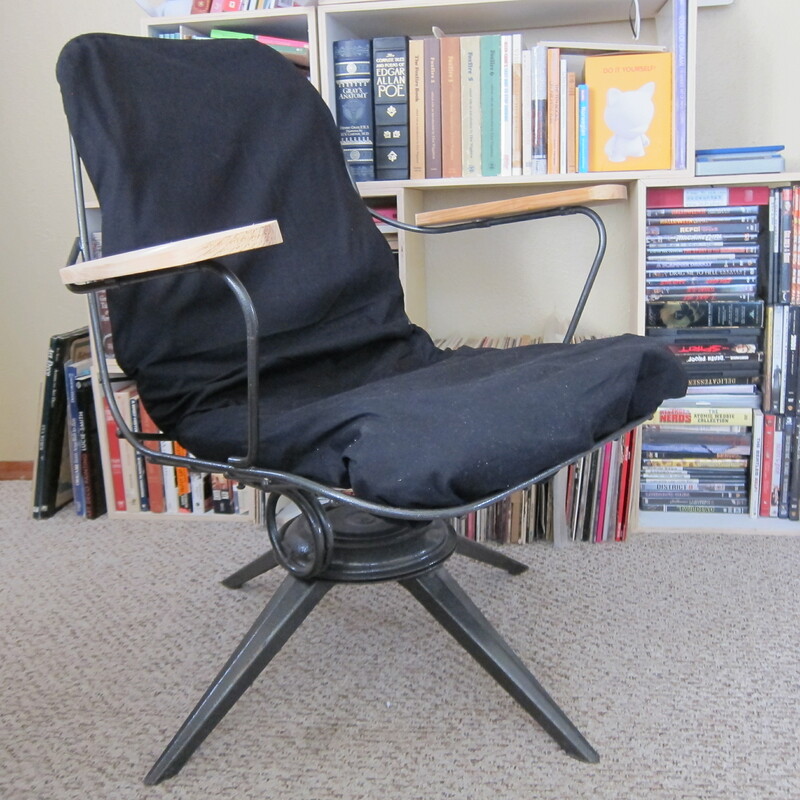 If I end up keeping the chair for a while I would like to make a more sleek cushion from black vinyl or leather, but at least for now it looks good enough to keep around. The chair was likely made by Homecrest as an indoor/outdoor piece. The Minnesota based company still makes furniture today and has a page on their website talking about the “vintage wire” collection. A lot of the ones I’ve seen were used as patio chairs but others with leather or vinyl cushions seem to look good indoors. Since I didn’t really have room for it, I’m using it to replace my computer chair. With its sturdy steel and enamel design and comfortable swivel and rocking motions, it should be functional and comfortable for many years.